© 2001 The Josef and Anni Albers Foundation/Artists Rights Society (ARS), New York, New York. Photograph by R. H. Hensleigh. Josef Albers was one of the first modernist artists to focus on color theory and composition, and is credited with influencing the movements of hard-edge Op Art and Minimalism in the 1960s. Born in Germany, Albers enrolled as a student at the Bauhaus design school in 1920, eventually teaching there until it was forced to close by the Nazi party in 1933. He subsequently moved to America, where he held teaching positions at North Carolina’s experimental Black Mountain College, followed by the Yale University School of Art. While at Yale, Albers began his most famous series of paintings, Homage to the Square, employing a strict formula in which the full innermost square is not centered but positioned near the bottom of the canvas; the size of the color bands at the bottom are doubled on each side of the square and tripled on top. This structure causes the colors to advance or recede in response to each other. The colors, however, are also meant to interact with each other when processed by the human eye in ways that continually change their effects on each other. Albers demonstrated with this series that colors are not absolute in value—producing one “visual truth”—but instead are changeable. 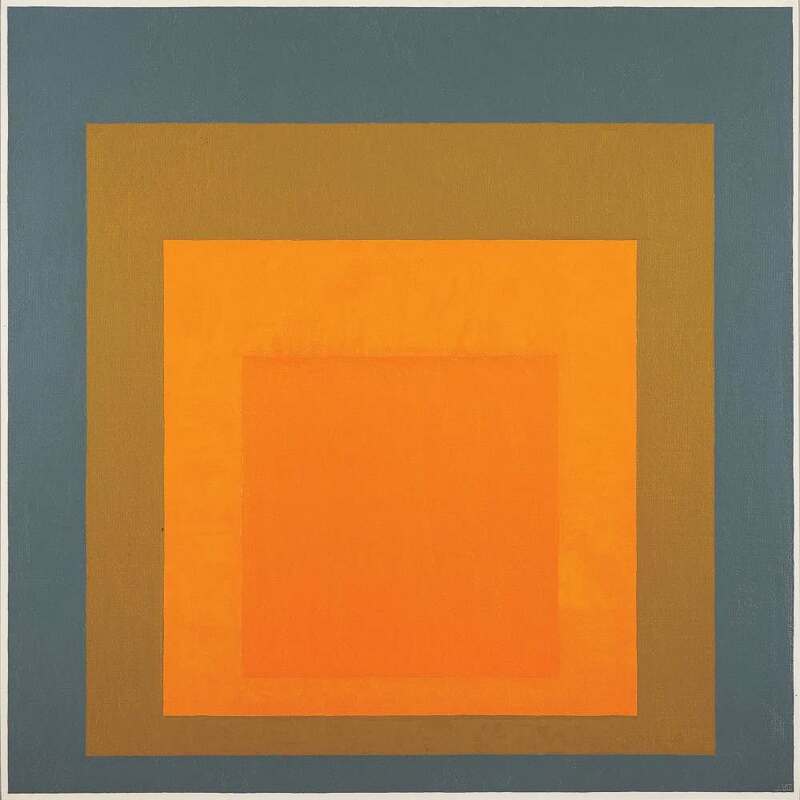 Albers started his paintings with six layers of white ground, maximizing the luminosity and saturation of the color placed on top. Then the colors would be applied to their appropriate sections directly from the tube with a palette knife, starting with the center and radiating out. The order and selection of colors was chosen after completing several small studies. In Homage to the Square: “Festive,” Cadmium Yellow Deep is the dominant central color, along with Cadmium Yellow Medium, Yellow Ochre Pale and Optical Gray #3 Cool. The work emphasizes rectilinear shapes of strong, flat color in progressively smaller forms calculated to illustrate his theories of how changes in placement, shape, and light influence and alter color. The work also articulates his lifelong commitment to absolute order based on mathematical proportion, balance, and unity, leading him to oppose what he perceived as the chaotic freedoms of Abstract Expressionism.